An arborist is trained in the science and art of caring for and maintaining plants and trees. Arborists are knowledgeable about the needs of trees and are trained and equipped to provide proper care. The arborist at God And Country Tree Service, LLC. has more than 13 years’ experience. 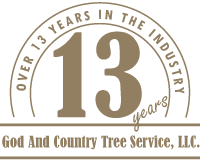 Why hire a licensed, bonded, and insured tree service? Tar spot is a common cosmetic condition that is unsightly, but does not harm a tree and is usually cyclical. For a professional opinion regarding the health of your trees in Roseburg contact us at (541) 761-5141. Most trees can be pruned year round in accordance with flowering and fruit production cycles. Certain trees require canopy reduction following a flowering period and not before. Consult God And Country Tree Service, LLC. staff for more details. God And Country Tree Service, LLC. can cut your tree into firewood or remove it from your property as desired. Does God And Country Tree Service, LLC. have regular maintenance packages? Yes, we provide the Roseburg area and surrounding regions with seasonal tree care packages that include a complete line of tree care services. If your question wasn’t answered here call the tree experts in Roseburg at (541) 761-5141.